On the back of every pattern envelope, they list the notions you will need to buy to sew the pattern. Most free internet patterns offer a materials list that will tell you what you will need to sew the pattern or project. Even when thread is not listed, if you are going to sew the pattern or project, it's a safe guess that you are going to need thread. All purpose thread is the most commonly used type of thread to construct garments and most projects. All purpose thread is offered in a huge selection of colors but that doesn't mean you're always going to find the perfect color. Almost all print fabric has one color that is predominant or the background color. That background color is the color that you want to match when you choose the fabric. Even if the back side of the fabric is white and all of your stitching will be inside the item, you want the thread to match the right side of the fabric, just in case the thread was to show on the outside of the garment. When an exact color match is not available, choose the closest match with the color being slightly darker rather than lighter. A darker color will blend into a seam better than a lighter color and seem to match in a much better way than a lighter color. Choosing a thread color for topstitching does not mean you have to have topstitching in the same color as your construction thread. You can make your topstitching stand out or pop by using one color in the fabric or a contrasting color. It's a choice you make because you are designing your finished item even if you are using a commercial pattern. When you get to the fabric store the thread displays can seem very intimidating. 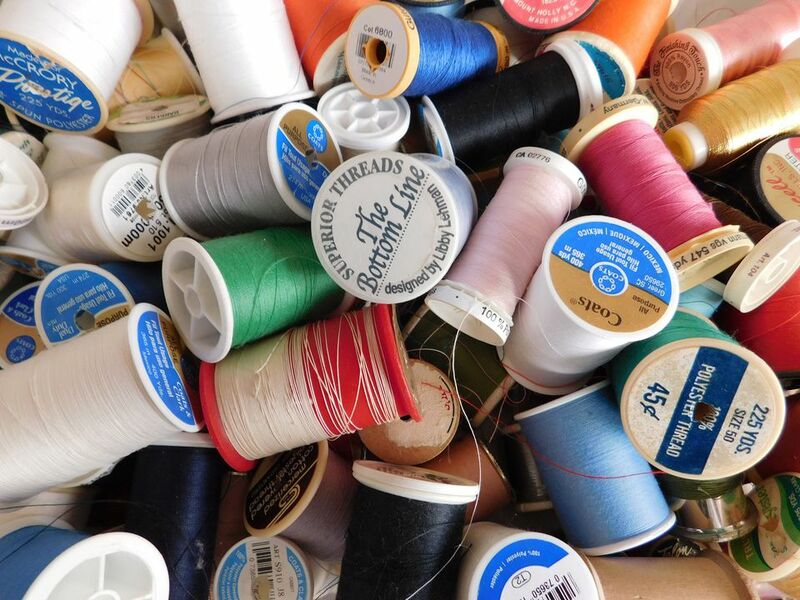 There are all kinds of threads and a huge variety of colors. Just because your fabric is polyester, does not mean you want that pretty, shiny polyester thread. The shiny polyester thread is for machine embroidery and is not as strong as an all-purpose or wrapped thread for construction purposes. Button and carpet thread is not a normal construction thread. Although the thread is strong it is not designed for construction. Bobbin thread is not a construction thread unless you are working on a very fine fabric. Always have a sample of your fabric with you to get as close a match as possible. We all want to use what we have on hand or easily available. Remember though that thread does age! Reaching into the thread that your great grandmother left for you is not always a good idea! Test the quality of the thread by trying to break it and feeling a section of the thread for smoothness. If the thread breaks easily or it feels lumpy, throw it away! It's not worth having unreliable seams that could break open, usually at the most inopportune places and times, rather than spend the money on a new spool of thread. Poor quality thread can also cause sewing machine problems and no one wants that kind of aggravation when they are being creative by sewing. Learn how the sewing machine, parts of the sewing machine and thread all work together to sew perfectly and hassle free!